Boost your cleaning efficiency and safety with Agar’s complete Cleaning and Sanitising Program and high performance food and beverage cleaning products. The complete Cleaning and Sanitising program includes onsite monitoring and reporting, cleaning procedure support, onsite and online training, surface microbial testing and OH&S documentation to make reducing your risk easy. Get the support you need to ensure your operations are consistently returning hygienic and efficient results. Boost your facility’s cleaning confidence with the support of Agar’s cleaning experience, expert technical advice and responsive service. 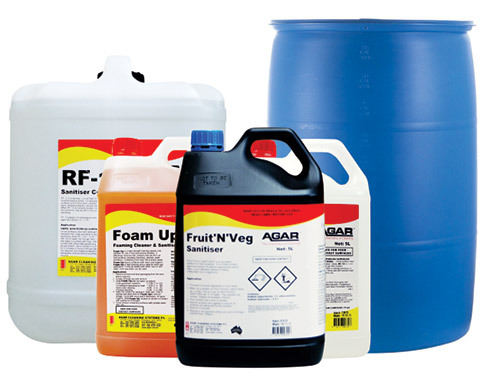 You can trust the performance of Agar’s cleaning chemicals as it has been manufacturing them for over 50 years and supplies them all over Australia. Contact phone number, please include area code. Trust in Agar’s high quality, concentrated cleaning and sanitising products – formulated to improve food safety and minimise the risk of cross contamination. Get your staff trained in chemical safety by the experts with Agar’s onsite and online training programs. Keep track of the cleaning and sanitising program, swab test results and changes to procedures with monthly site visit reports. Make sure your operation is using the most efficient and effective cleaning procedures with the support of Agar’s expert technical advisors. Quickly address any potential points of cross contamination with Agar’s instant, onsite ATP swab testing. Site assessment to determine best cleaning practises for your facility that comply with quality and food safety programs. This includes determining the right chemicals to suit your specific application. Want access to expert technical advice and How-to Guides?